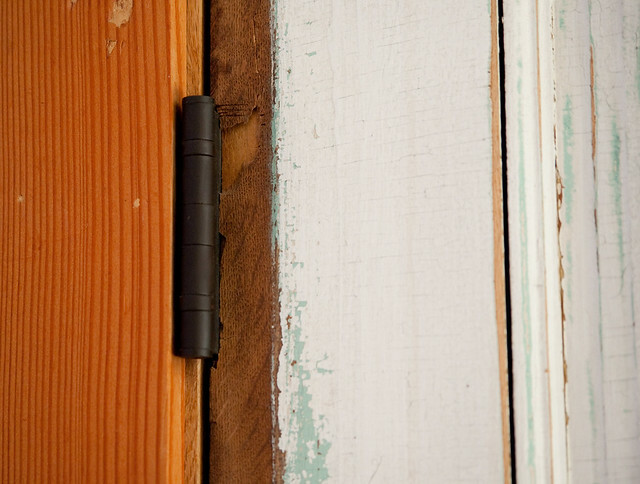 Using salvaged hardware and materials in your home is a simple and cost-effective way to add character. When Sue and her husband designed their new home, they used eco-friendly materials throughout, like reclaimed wood flooring and petroleum-free insulation. 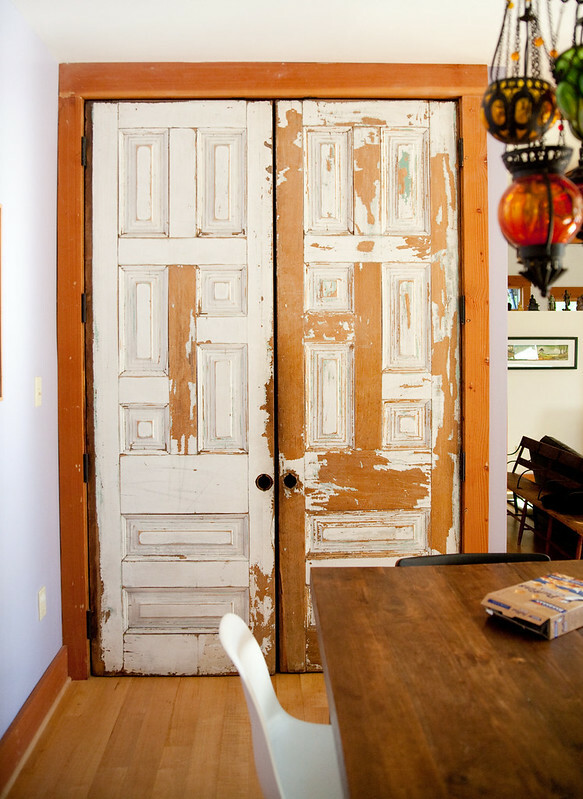 And, after doing some research online on upcycled doors, they took a spontaneous road trip to New Jersey to check out some salvaged doors. The trek was worth it. They came home from Recycling the Past in Barnegat, N.J. with 10 solid oak interior doors that not only saved them a pretty penny, but look fantastic in their home as well. Here are two adjoining doors that the used for their kitchen pantry. 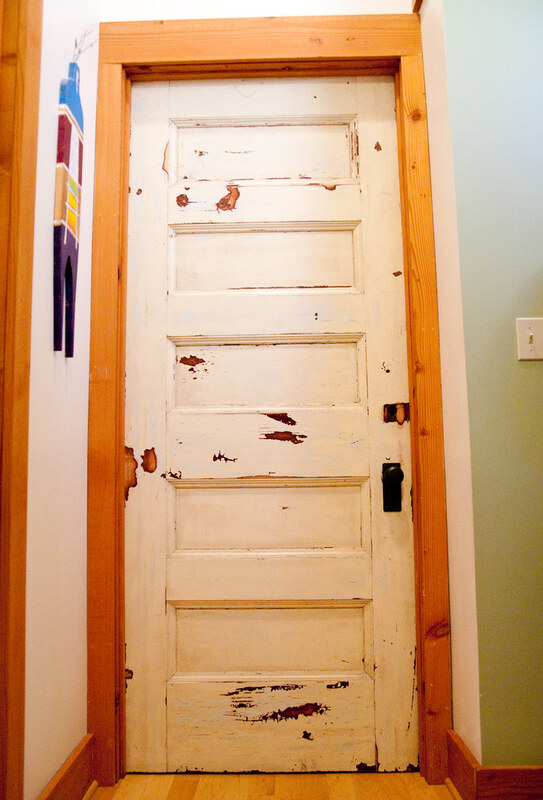 Sue said the doors had layers of paint, but they chose to only have them sanded down by a professional. It’s a deliberate interior design choice to leave the doors looking distressed. The pantry doors don’t have knobs, but they don’t really need them to function. And they look pretty cool in their original state. They did have to buy new hardware to install the doors. 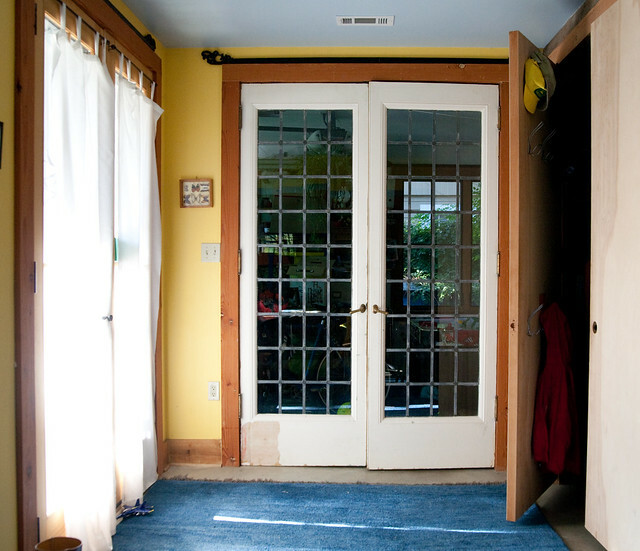 But, because they built their home from the ground up, they could size the door framing to fit the doors rather than having to alter the existing door frame. 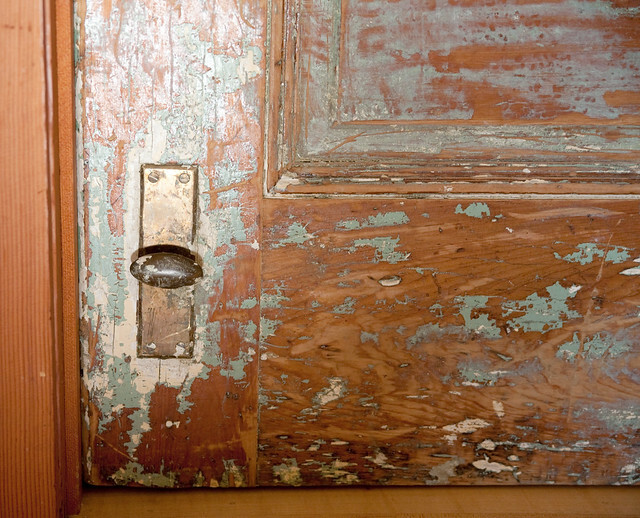 If you buy a salvaged door, you may have to make some adjustments for the perfect fit. Here’s the door they used for their coat closet in the living room. 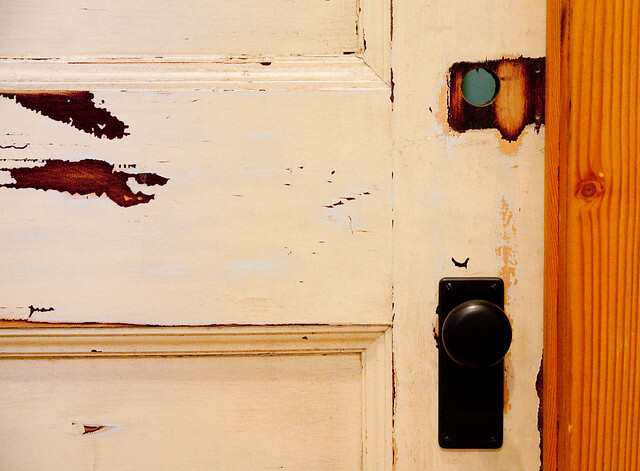 You can see three original door knobs on the left-hand side. 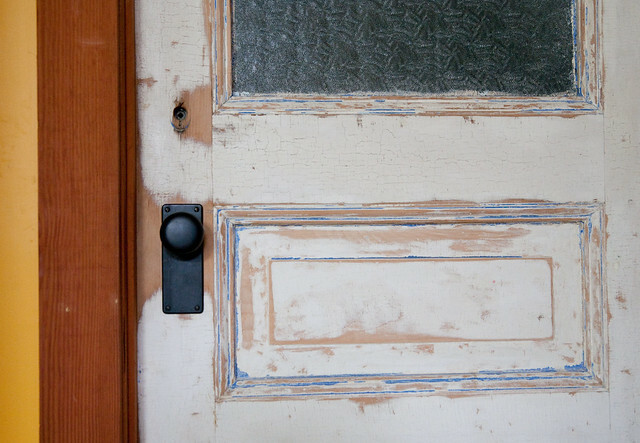 I wonder why the original door had the three knobs to begin with? Any guesses? It certainly adds character. 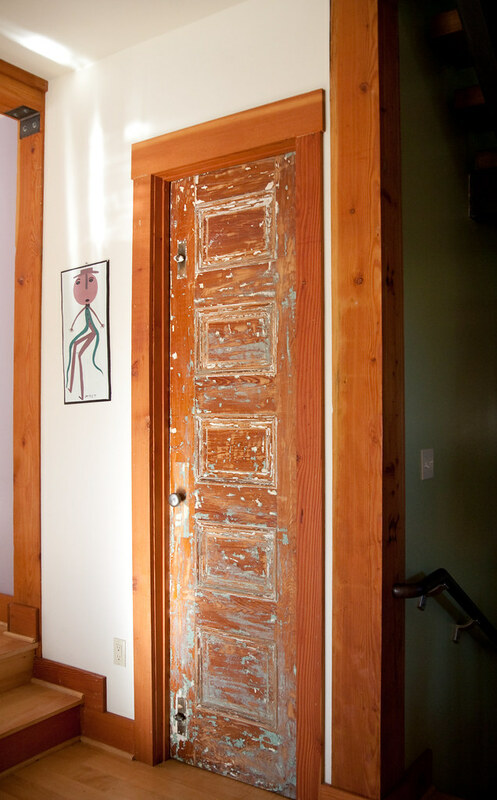 On their second floor, they installed three salvaged doors. 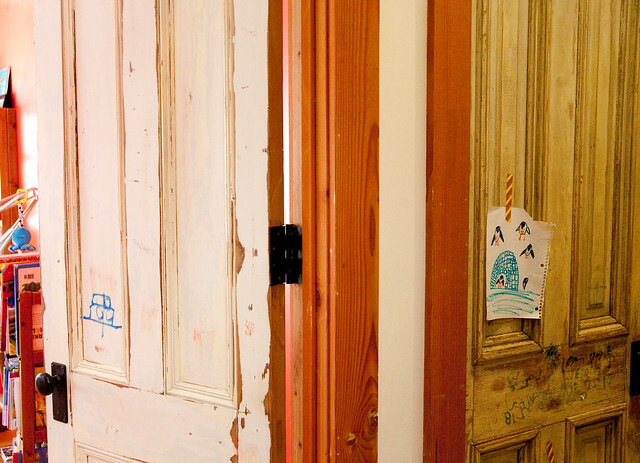 These two side-by-side doors belong to their boys’ rooms. 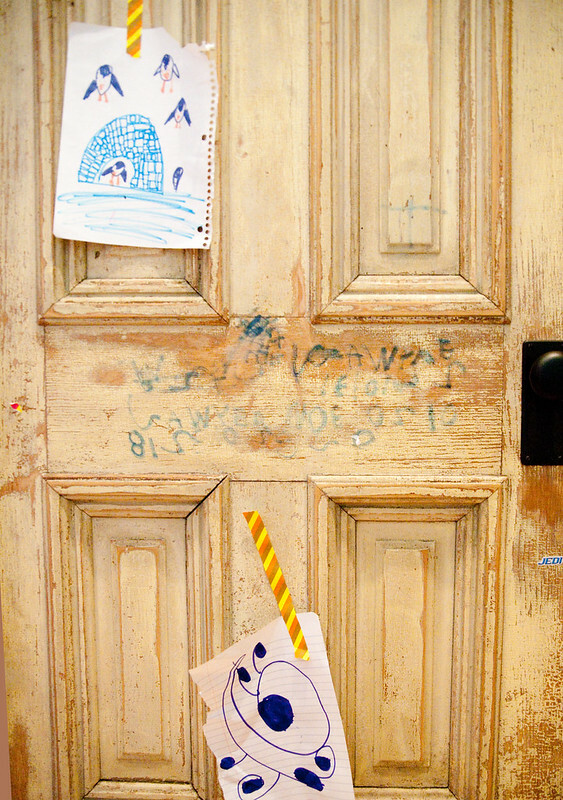 The boys have added a little of their own artwork to the natural imperfections in the wood. 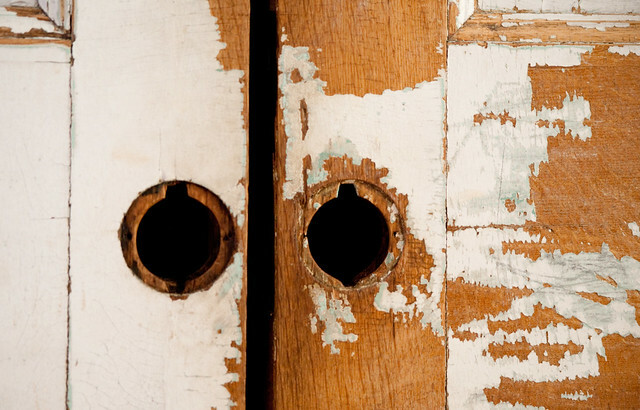 And, like the pantry doors, has a hole where the old door probably included a lock. 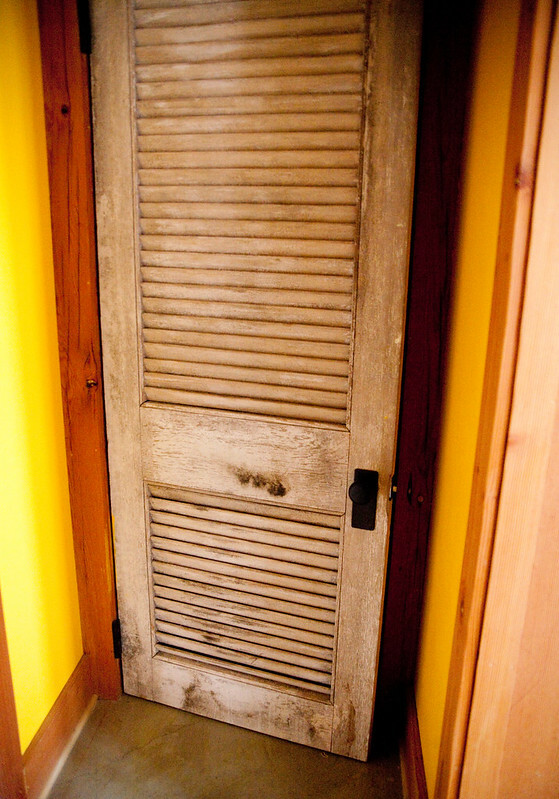 Inside the master bedroom, instead of using salvaged doors, they hung antique Indonesia teak panels that swing into the bathroom. 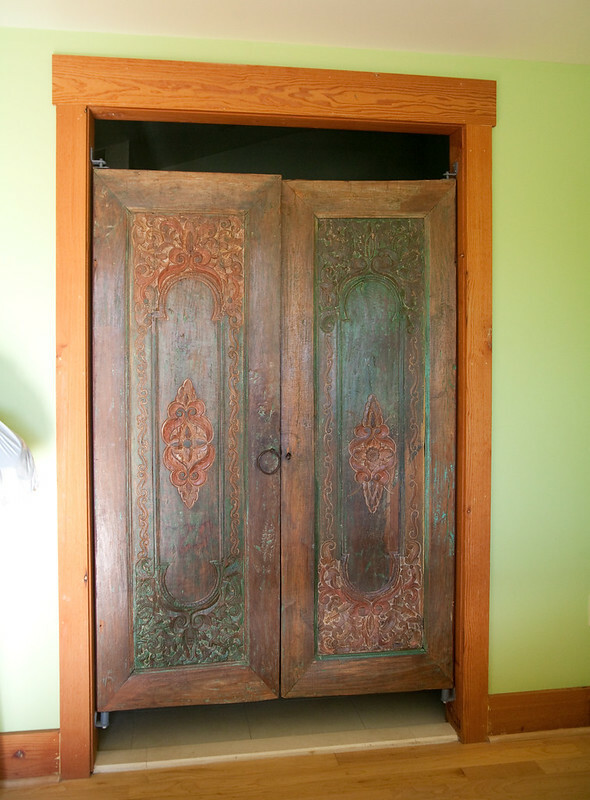 Sue had purchased the doors from an Asian import company in Old Town years ago. The hand carving is so exquisite. They used another set of leaded glass double doors in their basement, leading into Sue’s studio, which we toured last summer. Also in the basement, she used a handsome shuttered door for a closet. 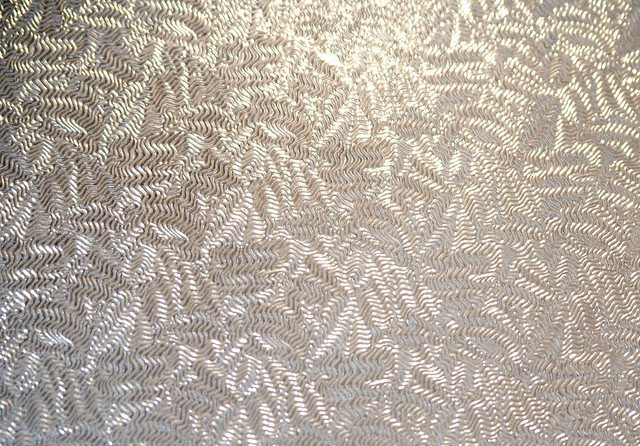 And one my favorites, this vintage door with its floral textured glass. Talk about character. If only the door could speak, I’d love to know all it witnessed. 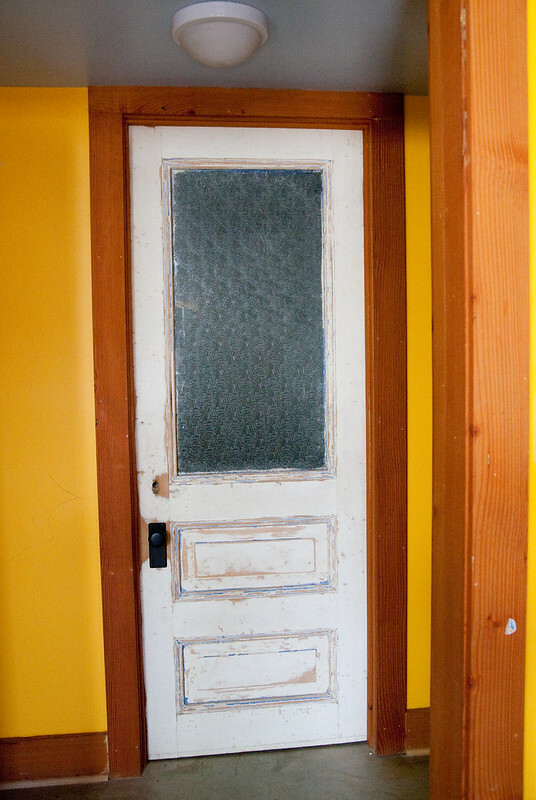 The use of these unique and solidly built salvaged doors were not only a cool design element in Sue’s home remodel, they were a huge money saver. Each door, bought new, would have probably cost double or more what they paid at Recycling the Past. 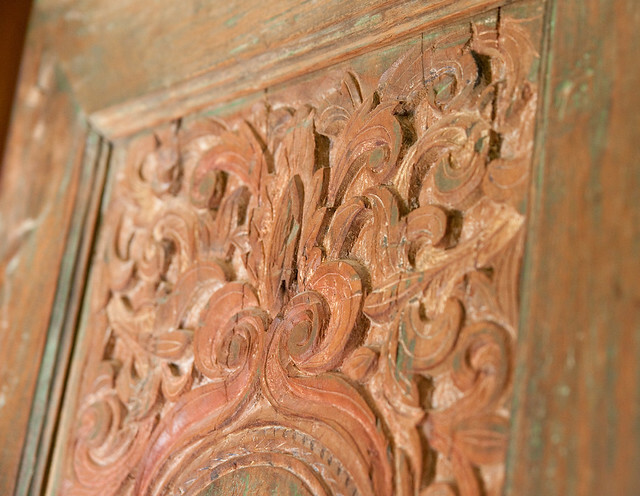 That said, you do need to shop around for good prices on old doors like these because the prices will definitely vary. A good place to look for salvaged doors around here is Habitat for Humanity ReStore, and Community Forklift. A word of caution – if you are using salvaged materials in your home with old paint, you might want to have them tested for lead. 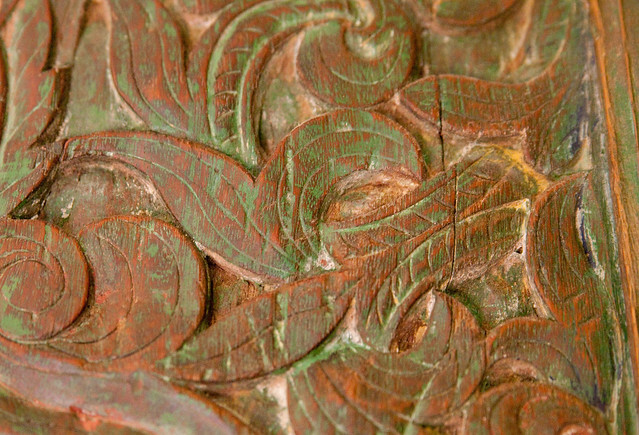 Have you used architectural salvage in your home as a design choice or eco-friendly upcycling option? Oh my goodness I love those doors! Guess who is going to be hitting up the ReStore & Community Forklift this weekend for supplies?